Finding a locksmith in East Providence, RI doesn’t have to be difficult. Jon’s Locks proudly serves the entire area, providing residential, commercial, and auto locksmith services to residents and business owners. We are located at 2291 W Shore Rd. in Warwick, and we serve customers at our shop on a by-appointment basis. We also have mobile service ready to come to you to take care of all of your locksmith needs. If you need a cost-effective solution for securing a home you recently moved into, having your locks rekeyed is the best option. This way, it doesn’t matter if the previous residents still have house keys. Those keys won’t work in your new rekeyed locks. How many times have you locked yourself out of the car? It happens all the time. Fortunately, we have fast mobile locksmiths ready to assist you. All you need to do is give us a call. Additionally, we make duplicate car keys and transponder keys on the road. We also program car remotes and key fobs. At Jon’s Locks, we are registered and insured. This means you don’t need to worry about someone who isn’t properly trained doing the job. When you work with locks, it’s easy to make mistakes, so you need a professional to do the job. 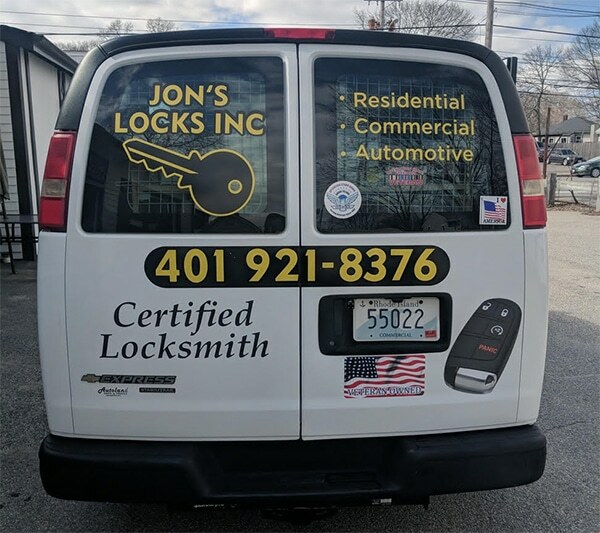 When you need a Locksmith East Providence, give Jon’s Locks a call. At Jon’s Locks, we offer premium services to customers throughout the area. When you’re looking for a locksmith you can rely on, we’re the best choice. Call Jon’s Locks to schedule an appointment. We’re happy to help you with all of your locksmith needs.